Each community in Orange County, NC has its own unique charm and personality especially during the holidays. You’ll be delighted by musical and imaginative performances by top artists, children will giggle in delight with Santa as they go about the countryside on a hayride, the twinkling of lighted lanterns along a river walk will inspire you and we all know comedy relief is always welcomed during the holidays. We all need a little bit of laughter during the holidays! On December 7, Transactors Improv: Christmas with the Folks who Live on the Hill is inspired by the 1937 Kern/Hammerstein song The Folks Who Live on the Hill. The performances are based on audience suggestions and divided into five episodes with live musical accompaniment by pianist Keith Sawyer. Entertainment begins at 8 pm at the ArtsCenter, 300-G East Main St Carrboro. Admission: $15 Public, $12 Senior, $10 Student. For tickets click artscenterlive.org or call (919) 929-2787. Everybody loves a parade! Come be a part of sights and sounds of marching bands, beautifully decorated floats, group performances and of course Santa on his sleigh. 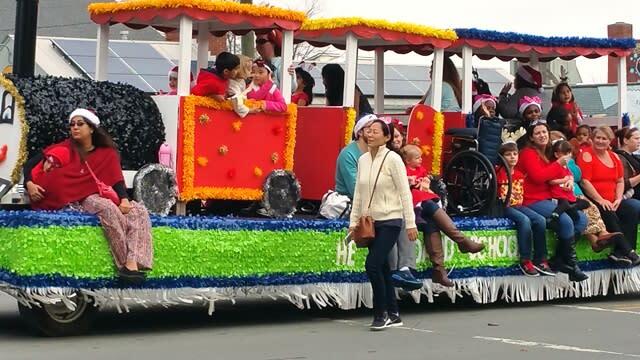 On December 8th, the Chapel Hill-Carboro Holiday parade begins at 10 a.m. at the old Post Office on East Franklin Street in Chapel Hill and ends at the Carrboro Town Hall on Main Street. Named “The world’s pre-eminent large jazz ensemble” by the Chicago Tribune. In this much-anticipated annual tradition, the Jazz at Lincoln Center Orchestra with Wynton Marsalis spreads holiday cheer with swinging renditions of your favorite music. Expect an all-star roster of guest vocalists! Performing at Memorial Hall on the UNC-Chapel Hill Campus, December 11 at 7 pm. Tickets start at $62. Call (919) 843-3333 or click www.carolinaperformingarts.org for details. Enjoy an extra special Art Walk on December 14th. 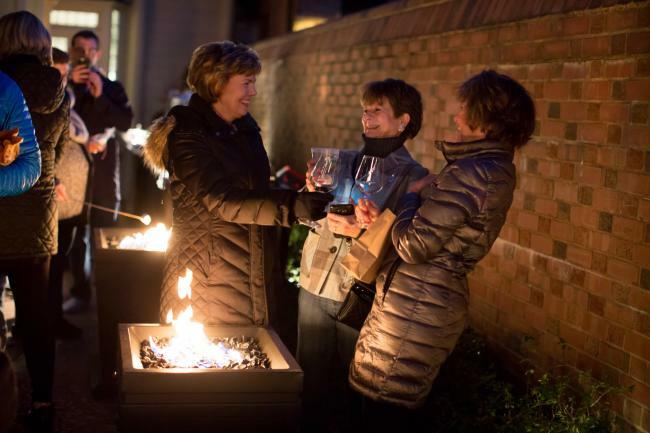 Franklin Street in Chapel Hill will be all aglow with luminaries lighting your way to shops and restaurants, caroling and comforting beverages at 140 West Plaza, 6-9 pm. During the weekends through December 16th, families will enjoy holiday story time, hayrides with Santa, and milk & cookies for the children in a beautiful Hillsborough countryside setting. Maple View Farms will be dressed in holiday lights and create a lasting experience the whole family will cherish and remember. Maple View is located at 3501 Dairyland Road in Hillsborough. Why not pick up some of their famous homemade ice cream while you’re there, now in seasonal flavors. Cost is $8 per person. Reservations are required so call (919) 942-6122. Check their website for time slots at Maple View Agricultural Center. And how about ice cream for breakfast with Santa? On December 15th, the elves and some of Santa&apos;s friends from the North Pole will be on hand to serve up delicious ice cream treats. Visit with Santa and wear you holiday pajamas. Maple View Farm Country Store, 919-960-5535. The Hillsborough Candlelight Tour is a unique opportunity to tour personal homes and historic sites with festive holiday decor, local musicians, and the pop-up readings from authors and local students. Musical performances will be scattered about 10 festively decorated locations. the complimentary miniature train in the downtown historic district will be popular with the kids as well as visiting with Santa & Mrs Claus. The Burwell School will again host a gingerbread exhibit. And new this year is the family-friendly "Hillsborough Passport" series, an exploration activity to discover some of Hillsborough best kept secreats. The December 16th (rescheduled from Dec 9) tour will last from 1pm to 7pm. Tickets are $20/$12 in advanced or $30/$18 day of event. For more info, contact the Hillsborough/Orange County Chamber of Commerce (919) 732-8156. Carriage rides will be available the day of the tour departing from the Burwell School every 30 minutes for $10/pp. Reservations required for ride. Each year The Carolina Inn puts on a spectacular display of enchanting decorations inspired by the traditional holiday song, The Twelve Days of Christmas. Now in its 21st year, visitors and guests will will once again enjoy the new holiday market on Sundays through December 23rd. Vendors from all over the state will sell crafted yuletide gifts from chocolates, to jewelry, to garlands and ornaments. AND, the forecast calls for snow each Sunday on market days. As true to tradition, the Inn will offer Holiday afternoon teas, festive dining with Santa, gingerbread house making, and the Holiday Express with Carolina Inn elves from through Jan 2. The historic Carolina Inn is located at 211 Pittsboro St. in Chapel Hill. Get all the details here… 12 Days of Christmas or call (919) 933-2001. The winter solstice, the longest night of the year is celebrated in Hillsborough with a Solstice Celebration Lantern Walk. On Dec 21 participants hold up their handmade white lanterns and walk along the Riverwalk to light up the night sky. The event is a celebration of the days slowly getting longer and the recognition of the quiet beauty of the new winter light. 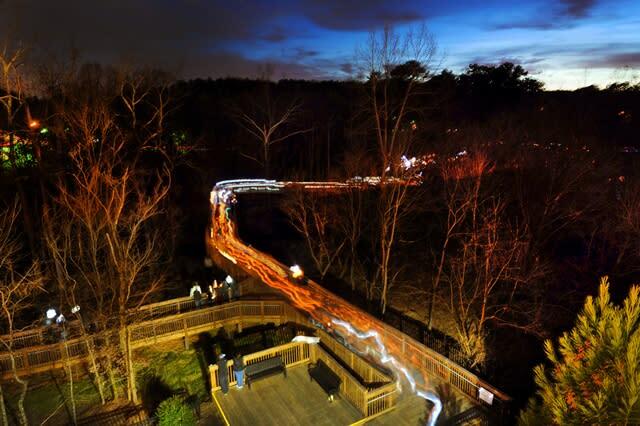 Spectators can view the ‘trail’ of lights and listen for the quiet twinkling of bells to an otherwise silent walk from the Eno Parking Deck where free parking is available (behind Weaver Street Market). The event is also free and open to the public but all participants must register in advance. For complete details, including lantern workshops, starting point and times, contact the Hillsborough Arts Council.